.925 Sterling Silver Anchor, Cross and Heart Danlge Bead. Total Bead Measurement is 25mm long and 8mm wide. Charm measures 15mm long and 8mm wide. Bead measures 3.5mm wide. 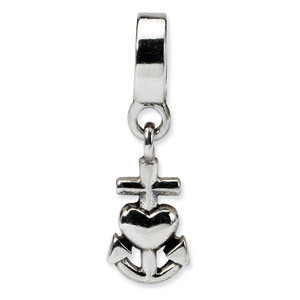 We guarantee our Sterling Silver Heart, Cross, Anchor Dangle Bead to be high quality, authentic jewelry, as described above.